Sorry for my absence last week, but I was working on a project for this blog and then Dora and I came down with colds, so hopefully everyone can forgive me (since I know that everyone noticed my absence). Recently several weekly link-ups/memes that I participated in have closed. It has been very disappointing, though I totally understand why the bloggers who ran them felt the need to close them. After awhile, it occurred to me that I should start hosting a weekly link-up/meme to help fill the void. It took awhile for me to come up with a common theme between all the link-ups that I participated in, but I finally realized that the one thing they all had in common was crunchy-ness. So I created “Crunchy Tuesday”. You can read more about this link-up at the bottom of this post. 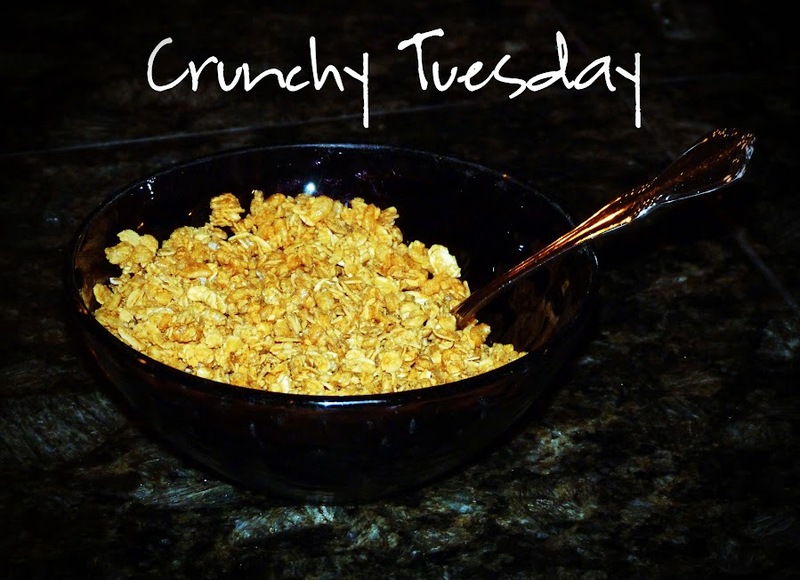 For my first “Crunchy Tuesday” post, I’m going to share with you the body custard recipe that I feel is finally ready to post. What is “body custard” you ask? That is a really good question! I was originally trying to make a creamy body lotion recipe from the book Better Basics for the Home, by Annie Berthold-Bond. Unfortunately, Annie never clarifies in the book (that I could find anyway) whether or not to use fluid ounces or weight ounces in her recipes. I e-mailed her to ask for clarification, but never heard back. So I finally just opted to muddle through the recipe to the best of my abilities. My best abilities were apparently not good enough, but I ended up creating an interestingly textured product, though not something that was truly useable. Once I figured out how to make the original recipe from the book (all measurements are in weight ounces), I decided that what I really wanted was something that was in between the actual recipe and my goof-up recipe.The problems that I had with the original recipe and many other natural body lotions and butters is that my very dry skin doesn’t seem to absorb oil. So these products just sit on top of my skin until I brush up against something, at which point I have dry skin AND oil-stained clothing and furniture. After months and months of experimenting, I ended up with what I believe, is a perfect recipe (at least for my skin). The texture is very custardy, so if the thought of a custardy body lotion seems gross to you, then don’t even bother with this recipe. I use it twice a day and it keeps my skin perfectly moisturized with no lotion build-up, like I get from commercial products and no oily residue, like I get from other natural lotion recipes. Anyway, without further adieu, here is my recipe (and please be kind if something goes awry, this is the first recipe that I have ever written/made, even though it is actually a variation of someone else’s recipe). ** Disclosure: I am providing Amazon affiliate links for all the ingredients to the exact brands of products that I personally use for your reference, but any brand should work just fine. If you click on these links and subsequently purchase from Amazon, I will earn a small percentage. Mix aloe vera gel, distilled water, glycerin, and grapefruit seed extract in a medium-sized heatproof mixing bowl. Melt the oils and beeswax in a pan over low heat. Mix with a hand mixer, working your way up to full speed setting (start on speed as it will splash at first, when it is very liquidy). Beat until the mixture is the texture of warm custard. Store in a glass jar with top. The mixture will become even thicker as it cools. Depending on the temperature and humidity, the mixture may begin to separate a bit, but it is still safe to use for 3 months (I go through a batch within 3 weeks, so I can’t verify this estimate, but the grapefruit seed extract acts as a preservative.) Obviously, if the “custard” begins to smell or you can see any mold, dispose of the product immediately.